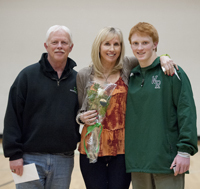 Three-time state qualifier and two-time district champ Cooper Bailey (right) shares a “Senior Night” moment with parents Tom and Jill Bailey on Wednesday night at Wood River High School gym in Hailey, Bailey (34-4 season, 114-37 career) also signed his letter-of-intent to wrestle at Nebraska’s Concordia University during “Senior Night” festivities for the Wood River High School wrestling team in Hailey. Also honored during the final home dual meet of the season against Canyon Ridge were fellow seniors Kyle Clark, Kaleb Guisasola and Riley Beck. Bailey, with a pin at 132 pounds, was one of four Wolverines who won their varsity matches Wednesday. Others were senior Kyle Clark (16-8) with a pin at 160, sophomore Ryan Anderson (24-9) with a pin at 120 and Taylor Douthit with a decision at 285. Next competition is the Challis Invitational Feb. 7-8.